When making jewelry I’m inspired by creating something out of nothing, I don’t need to have a great design idea when entering my jewelry studio. In the process of making earrings, bracelets and necklaces I get inspiration for new designs from what I have around me; colorful beads, semi precious gemstones and big bold buttons. If I do have a design idea before entering my jewelry studio, it’s usually because of unique beads or buttons I’ve just found. I might make drawings for how I could incorporate those unique beads or buttons into drop dangle earrings, a fun bracelet or bold necklace, or I might just start experimenting. In my jewelry I mix bold beads with fun button shapes and each new layer of beads or buttons adds depth and texture. When shopping for what I might like to incorporate in my handmade jewelry I think of what I love in nature and in life, so I buy flower and butterfly buttons, river stone, agate, jasper, jade and cute dog charms. Then there is what I love in fashion like big chunky accessories with unique details that make a bold statement, so I always use larger beads, buttons and charms when I can and layer a lot. Hollywood Glam Flower Bracelet shown above has a glamorous look perfect for fashion stars making a dramatic entrance. Original jewelry mixes red fire polished czech beads with silver and red flower buttons for a dramatic look reminiscent of old Hollywood. Vintage Style Flower Bracelet shown above has pretty flower buttons, fire polished czech beads, jade and crackle beads in bright blue and green. Bring fabulous back with chunky chic fashion jewelry. Vintage Style Glam Bracelet on the right has vintage style buttons with purple, pink and orange beads in a smoldering retro hollywood design. One of a kind jewelry for a glamorous woman. A jewelry designer at heart, I took a long time getting into jewelry as a career. Before designing colorful handmade jewelry I wondered why I felt so stressed-out in a drab office space while I was pursuing what I thought I should be doing. When I was young I did all sorts of fun craft and fashion projects and I felt great, so I started creating again to reduce stress. This time I focused on making jewelry, because I felt connected to the colorful beads, semi precious gemstones and all the unique trinkets I add to my fun jewelry designs like flower buttons and vintage buttons. There is an thrilling energy I feel when making fun drop dangle earrings, colorful chunky bracelets and bold vintage style necklaces. I feel like I’m replenishing my soul every time I pick up a bead and combine it with other beads and buttons to make my original handmade jewelry pieces. Now I tell friends to wear original jewelry as part of their everyday wardrobe for the office. It helps them feel inspired and energized while still looking professional. I also think anyone can make jewelry. Start with a cute but simple earring design and soon you’ll be making beautiful bracelets and necklaces too. Don’t miss out on the benefits of developing your own creativity. Long Fab Party Earrings shown on the left have fun flower shapes in a unique 4 button design. Here colorful flower buttons alternate with bright fashion buttons for these daring dangles. Buttons are handpicked to create long flirty earrings and only the most interesting buttons are used. So get yourself out there in vivid Fab Party Earrings. When I wear colorful handmade jewelry I relax and enjoy life. I wear jewelry to feel good and it always works. Now I want to improve everyone’s life with big bold earrings, cute bracelets and fun necklaces, because bright colorful jewelry brings more happiness to your day. Your environment has a bigger effect on you than most people realize. Never wear jewelry or clothing that makes you feel anything but your best. If what you're wearing doesn’t make you feel good, your fashion choices could be creating chaos within you. For instance if you only wear and accessorize with dark colors, slowly introduce brighter colors that are uplifting to your everyday and build on that. 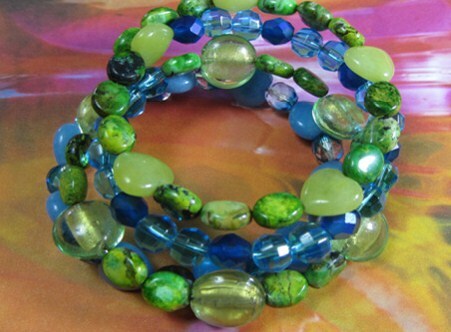 Making jewelry is also therapeutic when you use bold colorful beads and big fun buttons. You can use many other unusual design elements and incorporate them into a unique piece of jewelry too. When I’m in my jewelry studio with all my favorite colorful beads and bold buttons I imagine all the cute earrings, fun bracelets and cool necklaces I can create. My body and mind transformation starts to take place and my finished earring, bracelet and necklace designs never reflect any of my previous negative emotions. In these Big Bling Bracelets shown above you’ll find buttons with patterns and shimmery textures. The beads vary in size and shape complimenting the button colors. The loops connecting the big buttons to each bracelet chain add shiny silver accents, making these bracelets shine brighter in motion. 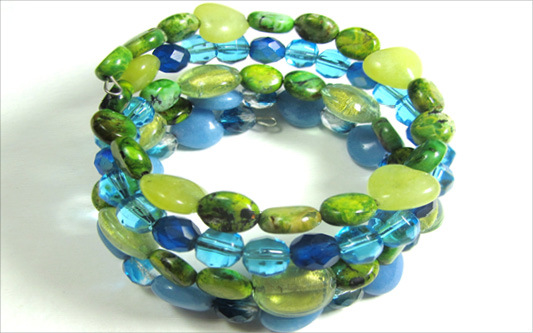 Fashionistas love colorful chunky bracelets, because you’re bold and your style is meant to be noticed. Candy Swirl Fashion Earrings shown on the right have swirl donut beads and pretty accent beads combined with larger fashion buttons. Big yet lightweight drop dangles make it easy to add fashion flare to your look. A must have fashion accessory for fashion stars.